Cathy Hair and Nails has moved into 860 South Winchester Boulevard at the previous location of CK Salon. The salon offers hair, nail care, manicure, pedicure, facial, and waxing services for men, women, and children. They carry a selection of the hair care products such as Mattrix, Paul Mitchell and Joico. The store front also advertises Colour, Perm, Highlights, Japanese Magic Straight Perm, Manicure, Pedicure, Eye Brow Wax, Acrylic Pink & White, Straight Face, and Eyelash Perm. 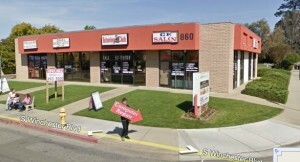 The site of CK Salon as taken from Google Street View. Cathy Hair and Nails are open Monday-Saturday from 10:00AM to 7:00PM and on Sunday	from 10:00AM to 6:00PM and walk-ins are welcome. El Habanero Restaurant will be hosting a Flamenco and Sevillana night on Sunday, November 1st at 6pm. The event includes a show and dinner. Flamenco is a Spanish musical genre, also popular in Japan. Sevillana is a popular flamenco-style dance from Seville. Koko de la Isla will be dancing. De la Isla has been studying dance from the age of 10 and has studied dance and choreography from the University of California Irvine. Also performing will be musicians Geoff Hawkins on guitar and Virginia Juan on vocals. De la Isla will be joined by dancer Pamela Martinez. Dinner will be your choice of Ropa Vieja with rice, beans, salad, bread and plantains, Arroz con pollo, salad, bread and plantains, Pechuga a la plancha, rice, beans, salad, bread and plantains. A vegetarian option of Vegie fajitas with rice and beans will also be available. Tickets are $25 for adults and $12 for children under 11 in advance. Tickets at the door are $30 and $15. For reservations, call (408) 557-8914. El Habanero is a new Cuban/Mexican restaurant located at 3132 Williams Road behind Mizu Sushi in the Grocery Outlet complex. It is in the spot previously occupied by Angelino’s Pizza. They are open for lunch 10:30-2:30 and dinner 4:30—9:00, closed Mondays. Ricardo’s Mexican Fast Food at 1750 Winchester Boulevard has closed and been replaced with Orale Mex-Grill. 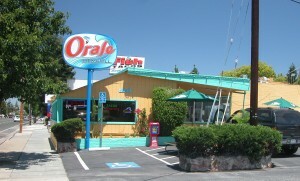 Open since July 5, 2009, Orale offers a variety of mexican dishes: tostadas, tacos, burritos, quesadillas. Their specialty is seafood, offering shrimp, octopus, oysters, clams, mussels, crab, tilapia, salmon, red snapper, ahi-tuna, halibut, and scallops. A full menu is available from their web site. Located just south of Hamilton Avenue, the interior of the restaurant has been extensively renovated. Both the kitchen and the dining area has been redone with new flooring, new furniture, and new paint. 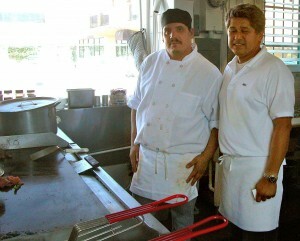 Co-owner Hector Plascencia tells the South Winchester News that customers have been very receptive to the new restaurant. “People are happy. They keep coming back. We have a lot of regulars. We’re happy to be in Campbell.” Reviews on Internet review site Yelp have been quite positive. The new Green Cup Frozen Yogurt held its Grand Opening Friday afternoon. 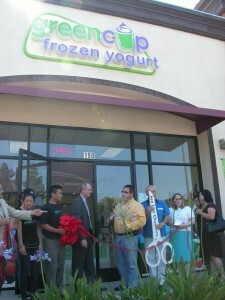 San Jose mayor Chuck Reed was on hand as well as Councilmember Pete Constant for the ribbon cutting ceremony. Mayor Reed gushed about how much he enjoys frozen yogurt. Some aspects of the environmentally friendly yogurt shop were highlighted. The signage is run on solar power, and the cooling system saves 3 gallons of water per minute compared to conventional frozen yogurt cooling systems. Green Cup participated in the San Jose Redevelopment Agency’s retail and recruitment program and sign grant program. The sign, designed by the owners, is the first solar-powered sign fabricated and installed with Redevelopment Agency assistance. Green Cup Frozen Yogurt is located in the First Century Plaza at 747 South Winchester Boulevard. The new Green Cup Yogurt at the First Century Plaza at 747 South Winchester Boulevard is holding a Grand Opening event on Friday, June 25, at 4 pm. Mayor Chuck Reed and Councilmember Pete Constant will be on hand for the ribbon cutting ceremony. The ribbon will be cut at 4 pm, and free samples will be available from 4 pm to 6 pm. Tana Market has just opened at 1358 South Winchester Boulevard. This was the previous location of Camaro Cleaners. 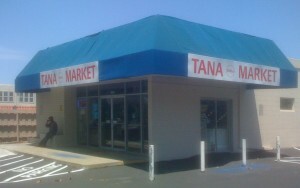 Tana Market moved to this location recently from their old location at 655 West Hamilton Avenue. Tana Market offers a variety of Ethiopian foods. They offer Ethiopian spices, grains, onions, oil, flour, honey, olive oil, and juices imported from Ethiopia and the Mediterranean. Tana is waiting for a conditional use permit to sell liquor, which owner Melaku Aynalen says could take 90 – 180 days. The Winchester Business Association has come out in favour of Tana’s application, writing a letter to the San Jose Planning Department, explaining that the only other place to purchase traditional Ethiopian liquor is in Oakland. As soon as Tana gets its permit, it will be “operating in full”. It has been partially open with a limited selection of foods for about two months. As soon as Aynalen gets his use permit, he will install a walk-in cooler and fill up the store and have a grand opening with an Ethiopian style BBQ outside. There is a significant Ethiopian population in the area, says Aynalen. There are two Ethiopian restaurants in the area – Selam at Winchester and Williams, and Zeni at Payne and Saratoga. 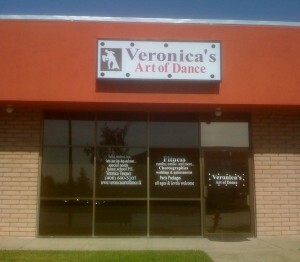 Veronica’s Art Of Dance has now opened at 860 South Winchester Boulevard. The dance studio occupies the space formerly occupied by Tutoring Club. The studio offers a wide variety of dance styles and has classes for all ages. They offer birthday party packages, studio rentals, ongoing classes, choreographies, and fitness plans. They are offering summer camps on weekday mornings and afternoons for kids ages 6 – 24 months, 3 – 6, and 7 – 12. For adults, they have dance classes for Zumba (a fusion of Latin and International music), Hip Hop, Latin, and Jazz. The KFC at 1805 South Winchester Boulevard has been closed while it undergoes considerable renovations which will include the addition of a Long John Silver’s fish restaurant. Located at the corner of South Winchester and Latimer, the KFC has been under construction for several months. Documents from the City of Campbell show that the Planning Commission orginally approved the remodel of the existing fast food restaurant to accommodate a dual brand fast food restaurant (KFC /A & W) in December 2007. In August 2008 the developers changed their plans to build a combination KFC / Long John Silver’s. The business owner was concerned that there was an oversaturation of the KFC / A&W brand in the area. There is currently a KFC / A&W location at the corner of Basom and Curtner. There was a dedicated A&W, closed several years ago, at 2145 South Winchester Boulevard. KFC before construction, taken from Google StreetView. Long John Silvers offers mostly deep fried fish and seafood. Freshside Grille is a new menu option which is fish prepared grilled instead of deep fried. Freshside Grille is only available at participating locations. It is not known if 1805 South Winchester Boulevard is a location that will participate. Psycho Donuts has opened at 2006 South Winchester Boulevard at the corner of South Winchester Boulevard and Campbell Avenue, just outside downtown Campbell. The donut shop’s theme is crazy donuts. They have donuts with names ranging from Green Tea Donut and FungShui to Split Personality and Bipolar to Major Head Trauma and Cereal Killer. The walls are adorned with artwork by local artists available for sale showing donuts being crazy. Customers are offered bubble wrap when they come in, and they can have their photos taken in a padded cell. Staff wear lab coats and nurse’s uniforms. Co-owner Jordan Sweigoron tells South Winchester News that business has been great since the opening on February 28. Some mornings there is a line of customers around the building when the shop opens. While the owners had intended the theme to be light hearted and fun, it has struck a wrong nerve for some people for whom mental illness hits close to home. Mental Health advocates have been protesting outside the donut shop, and giving out “Stigma-Free Donuts”. The protests by Mental Health advocates has given the small donut shop significant exposure. Local television news, news outlets from Florida to Minnesota, and hundreds of Internet blog posts have been writing about Psycho Donuts. Sweigoron admits that the exposure has helped bring in more traffic to the shop, but wishes the exposure was for positive reasons. Sweigoron says he wanted to open a donut shop that was unique, and points out that it’s the donuts that are crazy and not the people. 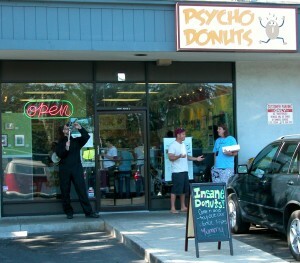 “It’s Psycho Donuts, not Psycho People”. 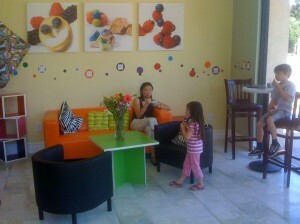 Green Cup Yogurt has had it’s “soft” opening at the First Century Plaza at 747 South Winchester Boulevard. The “Green” in the shop’s name refers to its efforts to be environmentally friendly. The cups and spoons are all biodegradable, air cooled yogurt machines instead of water cooled, VOC-free paint used throughout the store, and they use real yogurt made from 100% all natural ingredients. The store works like most new yogurt shops. Customers dish out as much of their desired yogurt flavour as they want into a cup, choose from a dozen “dry” toppings such as almonds and chocolate chips, and then choose from a dozen “wet” toppings such as fresh fruit. Coming soon will be teas and smoothies. Green Cup offers casual seating in a bright clean environment. You are currently browsing the South Winchester News blog archives.